It may seem surprising, but some customers still prefer to write checks. As a business owner, you might also want to continue accepting checks, given the costs of processing credit card payments and the possibility of credit card chargebacks. You may know the process for depositing checks made out to you personally, but what about business checks? While it's important to get it right, the process of endorsing checks to your company is not much different—just add a few extra details because the check is payable to your business. Write the business name, which should match the payee on the front of the check. Add any restrictions to the check that you require. If you accept a large volume of checks (more than a few per day, for example), you can also endorse your checks using a stamp. Online check printers and office supply stores can create a stamp with all of the information above, allowing you to fly through endorsements. Ask your bank about any requirements before ordering a stamp—they may have specific requirements, and it’s best to follow those instructions to avoid delays in payment processing. When you endorse a check, you authorize whoever has it to collect the money. That’s usually just fine because your bank will collect the money and deposit those funds into your account. However, if a check is lost or stolen after it’s endorsed, a thief could potentially cash the check or direct the deposit to a different account. A restrictive endorsement reduces your risk by limiting what happens to the funds after you endorse. For example, you can prevent the check from being cashed, so there will always be a paper trail showing where the money goes. The most common restriction is to write “For deposit only to account 123456” (using your own account number), which means that the check must be deposited to the account you specify. 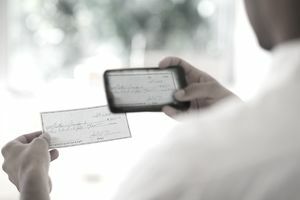 Banks are often hesitant to cash checks made payable to businesses, so you’ll probably have to deposit most of the checks made out to your business. But what about cashing those checks—is it possible to cash checks made out to a business? It is, but it’s challenging. Your best bet for getting cash is using your own bank (where you have your business checking account) after your account has been actively used for a while. Why cashing is harder: Checks made out to a business are complicated. If a check is made payable to you as an individual, it’s simple: The money is yours, so the bank just needs to verify your identity to cash the check. But businesses are legal entities. They may have multiple owners, and they may require the approval of multiple people to withdraw or spend money—and cashing a check is the equivalent to withdrawing money. Unless you’re at your own bank, a teller or customer service representative won’t know who is authorized to get cash from the business account. At other banks, for all they know, you might be authorized, but you could just as easily be a disgruntled employee or a thief who stole the check from the mail. It’s wise to require that customers write checks to your business. You’re acting like a legitimate business, and—assuming you’ve been doing everything right and avoiding personal guarantees—you can limit your personal liability if something happens to the company. Using personal accounts: Dealing with business checks brings added expenses and inconvenience, so you might be tempted to have customers make checks payable to you (as an individual). You might even be tempted to deposit business checks into your personal account: You’re already at the bank, and the money will eventually come to you anyway—so what’s one more check? Banks aren’t supposed to deposit those business checks to your personal account (unless you sign the check over, which is also unlikely to be approved). But in many cases, nobody notices, and you can get away with it. If the bank does notice, you risk delays getting paid and other complications, so it’s best to avoid this practice. Personal liability: Even if you can get business checks into your personal account, it is really best to use a business checking account for your business income. Using your personal account puts your personal assets at risk, and there might be other consequences. If you need more details, and some tips on how to get an (affordable) account open, see our page on opening a business checking account. If checks are too burdensome for you, evaluate other payment methods. Cost-conscious: If cost is your primary concern, cash and checks are the least expensive options, but these options have pros and cons. Cash creates security concerns, while checks can bounce and it takes time for funds to hit your account. Plastic: Credit and debit cards are favorite tools for consumers, but they can be costly for merchants. Still, it’s worth getting a quote periodically to find out how much you’ll pay. Be mindful of rules around adding surcharges to credit card purchases. Electronic payments: For more affordable payment processing, try collecting funds directly from customers’ bank accounts. ACH payments often cost less than card payments.